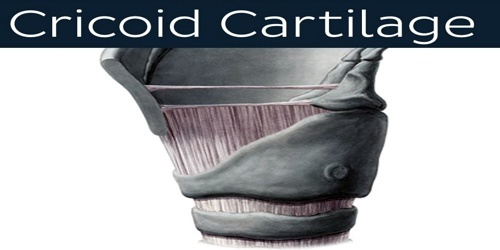 Cricoid cartilage is the ring-like formation at the base of the larynx. It is the only complete ring of cartilage around the trachea. It forms the back part of the voice box and functions as an attachment site for muscles, cartilages, and ligaments involved in opening and closing the airway and in producing speech. Cricoid cartilage increases its size as it goes posteriorly. Anterior size is the narrowest measuring 0.5 cm. laterally, it increases to 1 cm. The lamina is the broadest measuring about 2.5 cm. The inferior cornu articulates at the lateral sides of the cricoid cartilages via facets. On the posterior portion, it articulates with the arytenoid cartilages. All articulations with the cricoid cartilage are synovial. Cricoid pressure may frequently be applied incorrectly. Cricoid pressure may frequently displace the esophagus laterally, instead of compressing it as described by Sellick. Several studies demonstrate some degree of glottic compression reduction in tidal volume and increase in peak pressures. Based on the current literature, the widespread recommendation that cricoid pressure be applied during every rapid sequence intubation is quickly falling out of favor. Gastric reflux could cause aspiration if this is not done considering the general anesthesia can cause relaxation of the gastroesophageal sphincter allowing stomach contents to ascend through the esophagus into the trachea. 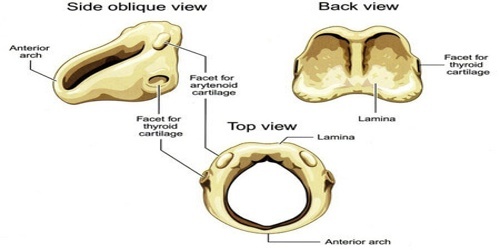 Cricoid cartilage has a circular ring-like structure. The word “Cricoid” is derived from the Greek term “krikoeides” which means “ring-shaped”. It is located slightly below the thyroid cartilage, which it connects with through the medial cricothyroid ligament. It also joins the first tracheal ring through the cricotracheal ligament. The thyroid gland has an anatomical relationship with this cartilage. The gland’s two lobes extend above on either sides of the cricoid, but the thyroid isthmus a bridge of tissue that joins the two halves of the thyroid over the trachea is below it. 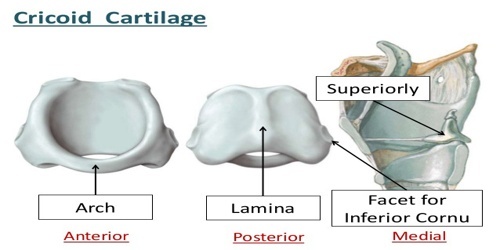 The lateral (side) and front portions of this cartilage are slightly narrower than the back portion. The function of the cricoid cartilage is to provide attachments for the cricothyroid muscle, posterior cricoarytenoid muscle and lateral cricoarytenoid muscle muscles, cartilages, and ligaments involved in opening and closing the airway and in speech production. Cricoid cartilage is composed of hyaline, which is soft and flexible in young people. However, it calcifies and hardens as it progresses in age. The cartilage may be surgically removed in rare cases where it becomes necessary to clear tracheal blockages.